ORGELKONZERT am 11.10.2018, 20:00, Domkirche / Klagenfurt - orgellands Webseite! prof. Roman Perucki (Gdańsk, Poland) - Graduated in 1985 from the Music Academy in Gdańsk in the organ class of prof. Leon Bator. He started teaching there in 1985, now as the professor of the organ class. He continued his studies in master classes in Poland and abroad. He is the chief organist in the cathedral in Gdańsk Oliwa and the counselor of President of the Gdansk City in a band of organ. He is managing director of the Baltic Philharmonic Orchestra (with it’s new seat Gdansk’s Congress-Music Centre; www.filharmonia.gda.pl), the President of Society „Musica Sacra” and Society of Friends of the Cathedral in Gdańsk Oliwa. He contributed to the creation new instruments in Gdańsk and in it’s neighbourhood. 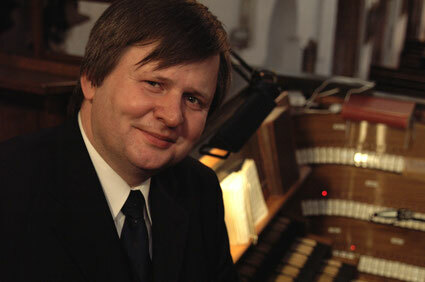 Professor Roman Perucki is the manager of the oldest in Poland, the International Organ Music Festival in the Cathedral in Oliwa and International J.P. Sweelinck Competition in Gdańsk, as well as other international organ-music cycles (in Gdańsk, Frombork, Jastarnia, Stegna, Rumia, Jastrzębia Góra and Żarnowiec). He is a member of the jury of the many organ competitions in Poland and abroad (France, Russia). He also does lectures master - courses in Poland, Portugal, Mexico, Croatia, Russia and France. Till present day he played more than 2500 organ concerts: solo recitals, concerts with accompaniment of chamber and symphonic orchestras, soloists and duo-concerts, among others with his wife Maria Perucka (violinist). He performed in the entire Europe, Russia, Japan, China, Mexico, USA and Australia. Among others he played in the Notre Dame in Paris and in the Gent’s cathedral, Mariinski Theater in St. Petersburg. and most famous concert halls and churches all around the world. He has recorded a lot of CD’s. He made recordings for national radio and television, as well as foreign phonographic producers and medias. He was given the Culture Prize from Ministry of Culture, many prizes from the authorities of the Town of Gdańsk and the highest Vatican’s distinction “Pro Ecclesiae et pontifice”, and Order of St. Sylwestre which he appreciates the most.